Dahlia 101 – "How to dig up and store tubers over the winter." We are continuing to meet on Saturday mornings, starting at 9:00 AM throughout the fall. Tasks will include garden maintenance and clean-up, digging up the tubers - a.k.a "The Big Dig". We will also be sorting, labeling, and storing the tubers. 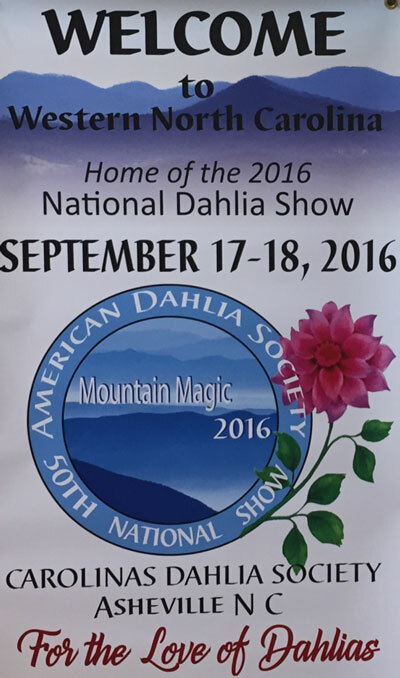 This is a great opportunity for "hands-on" dahlia education. Our own Joe Lysik took the top "King of Show" honor at the ADS Show, this is in addition to Joe’s multiple awards on the ADS Court of Honor. Congratulations Joe! We are very proud of of MIDS and the show they put on at Hofstra. This was one of the best shows we have ever seen. Dahlia growers came from near and far and were thrilled with our garden. I want to thank all the MIDS vistors that toured the garden, and a big thank you to all the LIDS volunteers for all the hard work they put in. 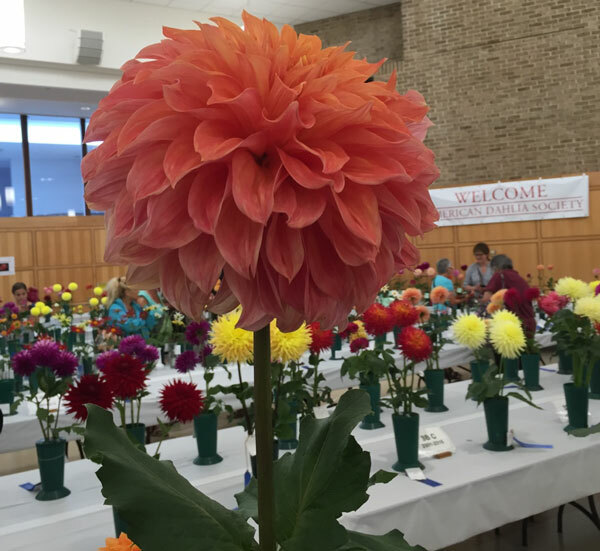 A BIG THANK YOU to everyone who participated in and helped make the American Dahlia Society Centennial celebration and the Mid Island Dahlia Society’s 50th anniversary such a wonderful success. Starting with the fabulous boat ride to New York City, the tours to Long Island mansions and gardens, the enormous flower show with over 2000 blooms, the wonderful dinner with so many flower friends, horse racing, and a beautiful afternoon at the William Wolkoff garden and picnic with the best steak prepared by Joe Laundrie and team - "wow" this was an event we can all be proud of – we did an excellent job representing Long Island and should all be extremely proud. My introduction to working outdoors began as a teen cutting grass, edging with those long scissors, trimming trees and bushes. For years I have been a perennial grower, after all nothing could be easier. When spring arrives so do all the flowers and they multiply by themselves. There were Poppies, Astilbe, Asiatic Lilies, Bearded iris, and Gladiolas in a wide assortment of colors. I always stayed away from any plants that had to be lifted. I had what I refer to as a "lazy man's" garden. I really enjoyed sitting outside and watching my garden bloom until August. By then everything was finished , now what? Wait for the leaves to change? Then I read about the Long Island Dahlia Society. I took a trip to the William Wolkoff Dahlia Garden and they still had flowers blooming in October! They came in an artist pallet of colors that were absolutely spectacular. 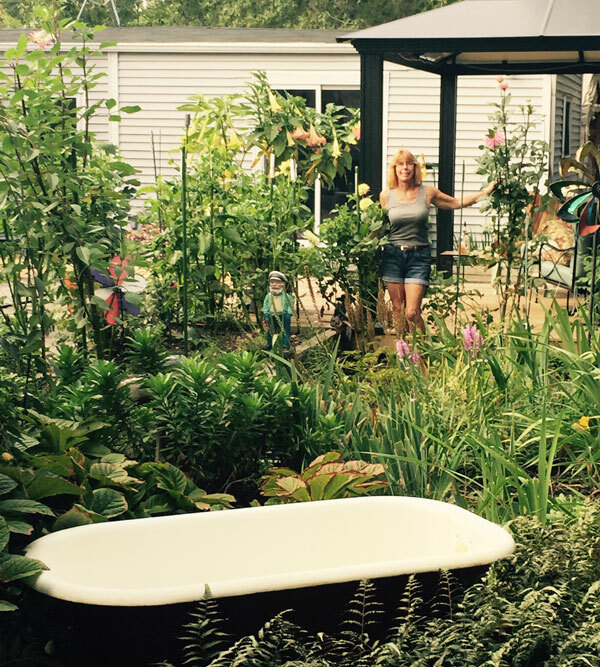 I know my philosophy was not to plant anything I had to lift…but this was definitely an exception! I started going down to the garden on Saturdays and there I was with the rest of the volunteers digging, washing, brushing , sorting, and labeling tubers. This didn't seem like work at all , it was more of a social gathering sharing stories and experiences growing dahlias. Nothing could have been better...I found my "Happy Place." Above: Holly in her "Happy Place"